It was a sunny afternoon, I was bored and jobless. So I said to myself “Akpos do something”, immediately I fetched my baking materials. 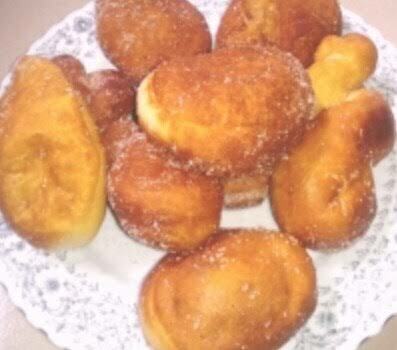 The end product is this fluffy, yummy and irresistible doughnut. Add sugar and salt to the warm water. Sprinkle the yeast on the sugar mixture. Cover with napkin or nylon and allow to activate for 10-15 mins. Add the milk, vanilla and egg. Whisk together. Add the melted butter and whisk thorough. Gradually add the flour, mix until a sticky dough is formed. Transfer the sticky dough to a floured surface and knead for about 15 mins or until the dough is soft and elastic. Cover the dough in a warm place to prove for 40mins or until it double its size. After 40mins, open the dough and remove air bubbles. Knead again and cut into desired shapes. Fry in hot oil (deep frying) until it’s golden brown. Place the cinnamon and sugar in a bag. Add the doughnuts in batches and shake till the mixture is evenly distributed. Serve and eat like a King/Queen. JULIASDAILYTIPS just introduced a GUEST POST SEGMENT.